But do we call it what it is? It’s the evil that Satan is wreaking upon our world as he is ‘roaming throughout the earth, going back and forth on it’. This was Satan’s answer to God in the beginning of Job when God asked Satan where he had come from. Satan is still roaming the earth, going back and forth on it – creating havoc. Just watch the news one time and you’ll see all of the publicity Satan is getting as he spreads his evil and hatred over the world. I don’t understand why people get mad at God when bad things happen – that’s what Satan is doing. Why don’t they get mad at Satan? We need to call it what it is. Call it WHO it is. Satan loves it when someone gets mad at God for something he did. He won that round! Satan is working very hard to distract us having a relationship with God. He draws our attention to things that would normally be ‘good’ but then they take all of our time so we have none ‘left over’ for God. Satan can win the battle using good things – as long as they distract us from God. When Adam and Eve sinned, they gave Evil a role in our world. When we sin, we give Evil a personal role in our lives. Yes, God is in control. But we choose to sin. And, as we sin, we give Evil more power as He roams the earth, going back and forth on it. So let’s not be distracted by Satan. Let’s not listen to Satan’s lies and his twisted half-truths. Let us focus our eyes on God who has already won the war. It is finished. And let’s call the evil and the pain and the hatred in our world what it is – it’s the work of Satan. Please help us win our daily battles with Satan, Abba Father. I have been separated from the crowd and I am set apart. He has given me a new heart and he has put a new spirit inside me. He has removed my stubborn heart of stone and has given me a soft, open heart. 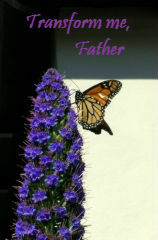 His spirit within me moves me to want to please him and accomplish the plans he has for me. He has a purpose for me. He is my God. He has saved me from myself. This is how I was taught. My parents and my family have always done it this way. Do you hear these things coming out of your mouth? Thoughts like this pop into my brain but I try not to say them out loud because – everything changes. God is a God of change. Things are constantly evolving, changing. My God is a God of transformation. He is renewing my brain, opening my heart and growing my perspective and understanding. I need to change. I have missed God’s work in my life if I do things the way I’ve always done them. If I act like I’ve always acted, it means I’m not letting God’s spirit move inside of me. God told the Israelites through Jeremiah that they needed to change. They needed to put away their idols and turn back to the One True God. The people responded that they were going to continue to worship idols ‘ just as we and our ancestors’ did. God was giving them a chance to turn back from disaster and they chose to continue traditions and habits that were going to destroy them. They refused to obey. They refused to change. And the consequences were devastating. Please open our ears so we will listen and obey, Abba Father. The old hymns bring back great memories for me. I was raised in a conservative Christian home and a very conservative Christian church in the Midwest. I don’t remember knowing anyone in my little home town who didn’t go to church regularly. My father was a talented musician who owned and operated a car body repair shop for most of his life. He had a beautiful, deep baritone voice. My mother had a nice alto voice and harmonized well. My youngest brother had a great tenor voice. Unfortunately, I also sing alto so my family quartet was missing a soprano but there were many good sopranos in our church congregation. So listening to my family sing the old hymns in church every Sunday morning was a treat – definitely my favorite part of the service. Those great old hymns reverberated off the walls as my church family sang them with energy and confidence. And my family contributed a beautiful part of it. My little town also had ‘Hymn Sings’ at the town ballpark during the summer. We would fill up the bleachers with people from all different churches while the organizers set up microphones and amplifiers on a stage over the pitcher’s mound. They hauled in an organ (no drums or guitars here) and handed out song sheets. People would yell out favorites and we would fill the summer sky with praises to God for 2 hours or more. I would sing harmony with my mom – no music, just by hearing it. I realized many years ago that I don’t know the melody of some of the old hymns – just the harmony. But I know them by memory and I also have the second and third verses of some of them etched in my brain. As I now read Ezekiel 34, these great memories come rolling through my brain as God says through Ezekiel, “there will be showers of blessing”. One of the blessings in my life has been a long family legacy of faith and trust in God which creates awesome memories like these. Thank you for your blessings, Abba Father. and, when God points out my next step, I need to do it. It’s a big mistake to ask God for guidance and then not do what he says. That choice is going to cost me. It’s going to cost you. There will be consequences. Our perfect Father is not going to miss this ‘teaching moment’. So, when I ask, I better be willing to do what God says. The Israelites asked Jeremiah to find out if God wanted them to go to Egypt. God gave them a clear and loud ‘no!’ but that’s not what they wanted to hear so they went anyway – an extremely bad and costly decision. In my life, I have found that it’s the perfect place to be. 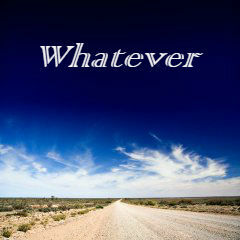 When I say ‘whatever’ to God, I’m acknowledging that I am SO not in control. And I’m trusting in the One who is. I am also committing that I am willing to ‘whatever’ he wants. Facedown on the floor, I say ‘whatever’ to the Creator of the Universe. I say ‘whatever’ to my all-power Father who loves me and wants the best for me. Surrendered. Right where he wants me. Whatever, Abba. I trust you. Our conversations with God are often filled with requests. And, throughout the Bible, God tells us over and over to come to him with all kinds of requests. He tells us to lay our cares at his feet and leave them. One of my favorite parables is the story of the Persistent widow. She knocked and knocked and continued to knock on the door of the unjust judge until he finally took care of her issue and gave her justice so he could get rid of her. As Jesus told this story, he then tells us ‘how much more’ our heavenly Father loves us so we should have no doubt he will take care of our concerns when we ‘knock on his door’. I have used this ‘persistent widow’ method in the middle of several stressful situations in my life. These were times where I needed to make a decision and I needed an answer from him so I knocked on God’s door until he answered. This meant that I prayed about this issue every time it entered my head – easily 50 to 80 times in a day. I found that many of these times, God changed my perspective as I prayed and listened. He has actually changed my perspective in the middle of these stressful times more often than he gave me a direct answer. By the end of some of these days, my understanding of what was going on was drastically different at the end of the day from when I started that morning. That’s so ‘like’ him, don’t you think? So now I don’t usually pray for a specific answer- I pray for understanding of what is going on and directions for how to move forward. 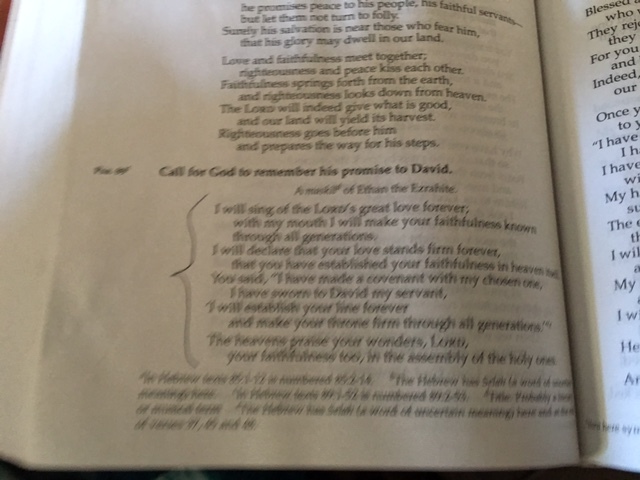 In Chapter 9, Daniel reminds us in his penitent prayer that we don’t make requests of God because we are righteous. We don’t make requests because we have done a lot of good things so now its God’s turn to pay us back. We don’t make requests because we’re ‘good enough’. We’ll never be good enough on our own. We can make our requests of God because he is merciful. We can make requests because he is full of grace. We can make requests because he loved us first and sent his Son to die for us. Jesus makes us good enough. 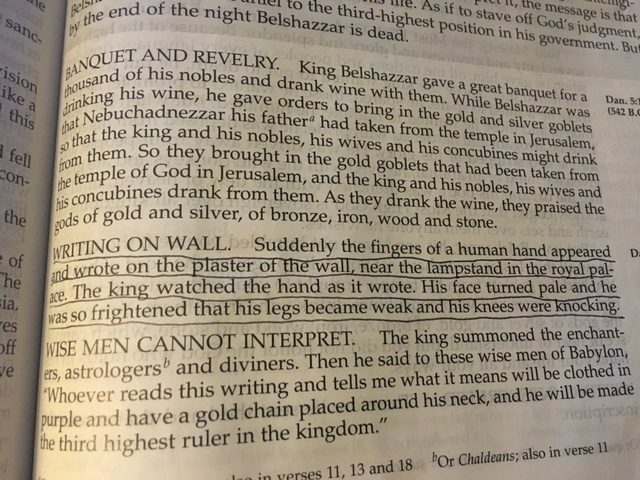 A human hand appears in the middle of King Belshazzar’s great banquet and it writes a message on the wall. This would definitely get my attention. And this is where we get the saying, ‘ I can read the writing on the wall’. Many of us don’t know that this comes from the Bible. 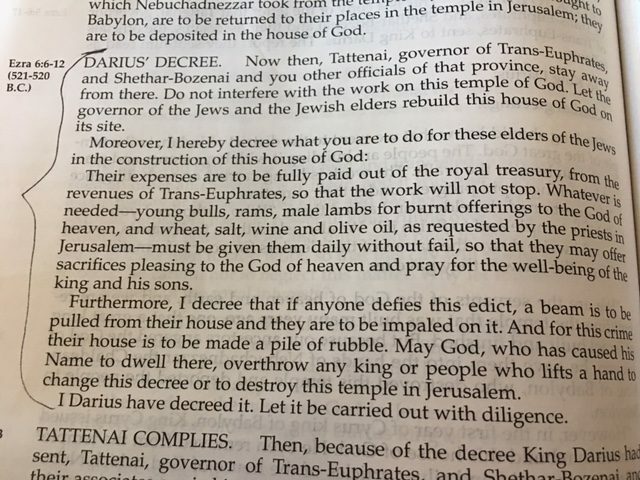 King Belshazzar could not read the handwriting on the wall so he consulted with Daniel who was well-known for being able to interpret things when no one else could. 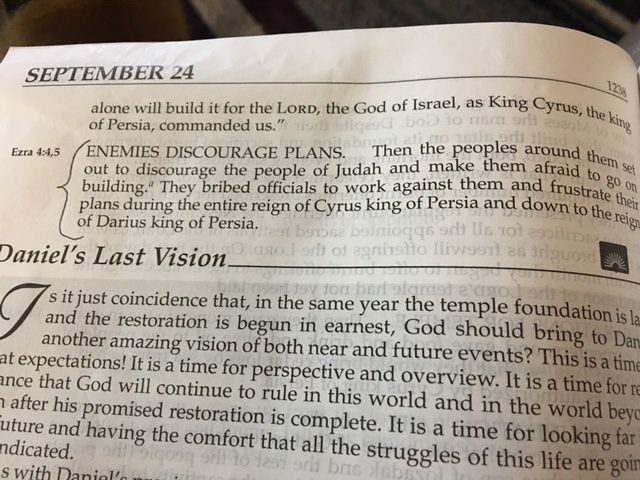 Daniel read the writing on the wall and told the king that God was bringing his reign to an end because the king had not acknowledged God as sovereign over all the kingdoms on earth. That very night, the message on the wall was fulfilled and Belshazzar was killed. One part of the message on the wall was ‘Tekel’ which means you have been weighed on the scales and found wanting. The bad news for all of us is – our scales don’t look any better. Our rebellion. Our need for control. Our self-centeredness. Our busyness which causes us to ignore God – not have enough time for him. The writing on our wall would have the same message…..
except for the fact that God loved us so much that he gave us an ‘out’. He sent his perfect son, Jesus, to save us from the eternal separation from God which we have earned. The entire Bible is a love story about how God created us in his image and desires to have a close, personal relationship with us. God offers a gift of grace to each one of us which we first have to accept in order to get the scales moved in our favor. Through Christ’s sacrifice, we can become precious children of God who are never ‘found wanting’ because Jesus did it all for us…. I will tell everyone about your faithfulness to me. I am confident that your love for us has no end. You say in your Word that we, as believers, are your chosen ones. We are a part of your church which is the Bride of Christ. We join with all creation to praise you, LORD! No one and nothing compares with you. You are more awesome than all who surround you. You rule over the sea and the waves. The heavens and earth are yours and everything in them. You created the north and the south. You are powerful and strong. You define justice and righteousness as well as love and faithfulness. We are blessed when we walk in your light and truth, LORD. 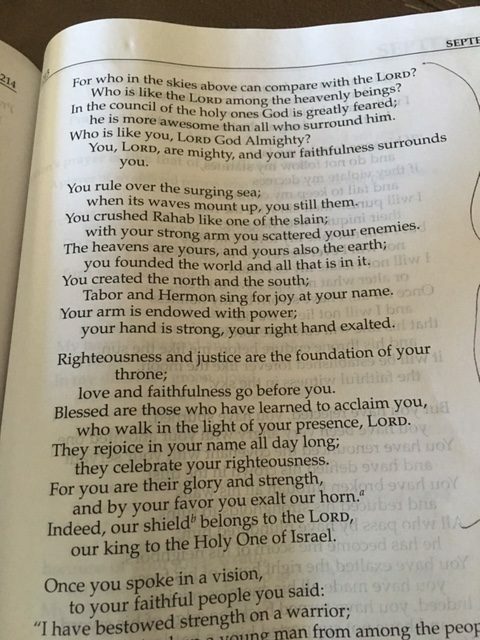 We rejoice all day long because we know you. You are our strength and our protector. We will sing of your great love forever, Abba Father! We can’t understand him! His existence will never end. 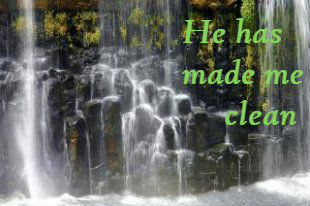 Raindrops fall at his command – purified as they pour out of the clouds. His thunder rolls out of the heavens and he scatters his lightening – sending it down to the depths of the sea. His lightening hits its mark. His thunder announces the approaching storm so that all creatures know its coming. 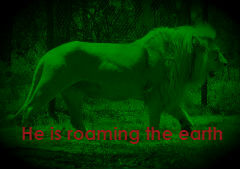 His majestic voice roars with the thunder – resounding out over the earth. His voice is marvelous – beyond our understanding. 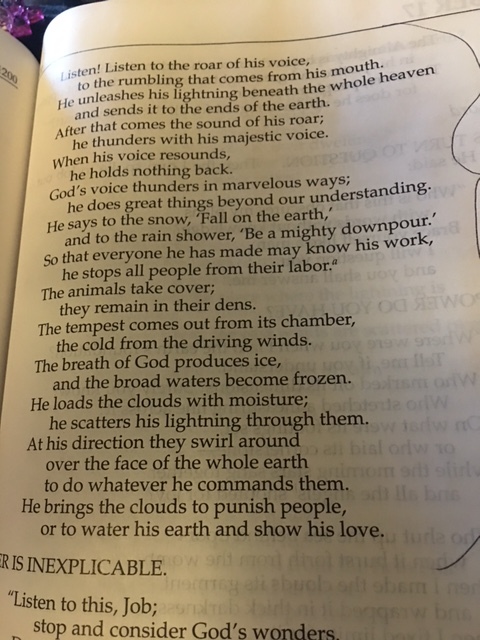 He sends the snow and the mighty downpour of rain to stop people from their labor so they can see and know his mighty work. ‘The breath of God produces ice and the broad waters become frozen.’ (Job 37: 10 ). 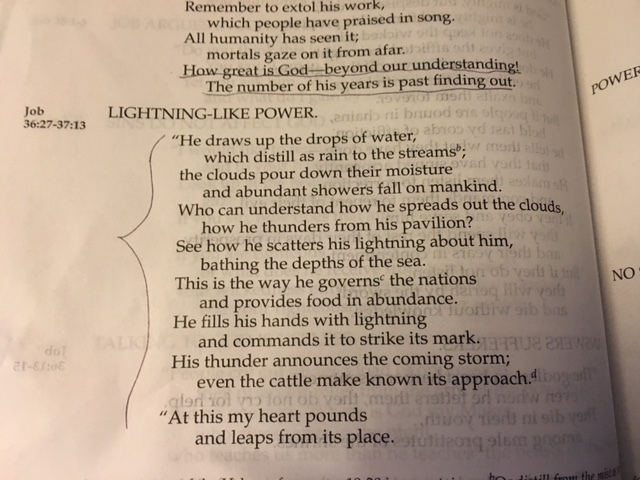 He loads the clouds with moisture and his lightening flashes through them as they swirl over the face of the earth according to his commands. His clouds can punish people. 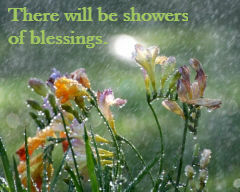 They can also water his earth and show his love.